The story of the controversial inter-racial marriage between Botswana's leader Seretse Khama and his wife Ruth. A film that plays like a Monday morning lecture, A United Kingdom will find its natural home on TV/DVD combo players wheeled into classrooms by teachers too hungover to deal with their pupils. It's that time of year once again; 'Awards Season', when a bunch of movies adapted from Wikipedia articles are strategically released to appeal to all those old voters who apparently only watch movies in the final two months of the year. Kicking off the season is Amma Asante's highly disappointing follow-up to her impressive breakout hit Belle, A United Kingdom, which is based on the book Colour Bar by Susan Williams, but which might as well be an adaptation of the Wikipedia entries 'Sir Seretse Khama' and 'Ruth Williams Khama'. We meet the pair in 1947 London, which here looks awfully glamorous for a city that was being bombed to pieces only a couple of years prior. 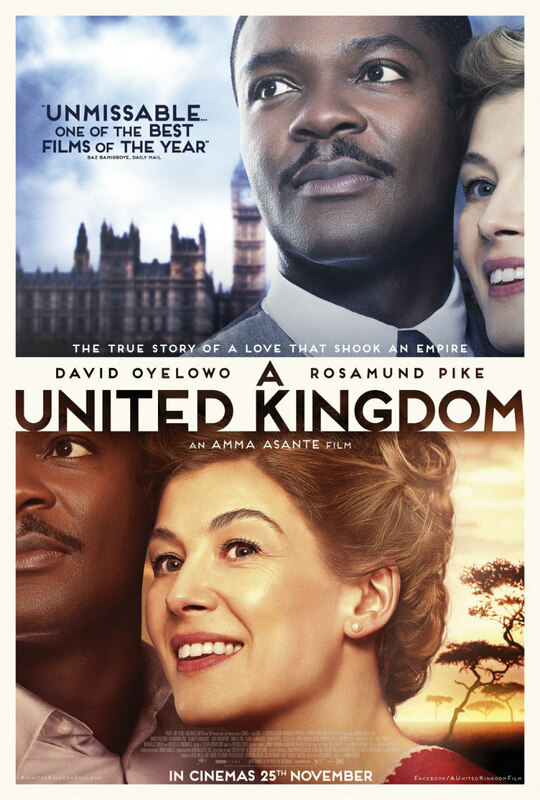 Seretse (David Oyelowo), the heir in waiting to the throne of what we now know as Botswana, is studying law when he has a meet-cute with local white dullard Ruth (Rosamund Pike). As they physically resemble David Oyelowo and Rosamund Pike, the two instantly fall for one another, and after a quick montage of jazz record swapping, Seretse is on his knees proposing marriage. Despite the objections of her racist father (Nicholas Lindhurst), whose distaste at the relationship is verbalised in a monologue that wouldn't be out of place in a 1966 episode of Till Death Us Do Part, Ruth agrees to the proposal and the pair make plans for a new life as King and Queen of Seretse's homeland. Said plans are disrupted when they're informed by a nasty British government official, who appears to have stepped off the Death Star, that their marriage could cause a war with South Africa, which has just introduced apartheid. In the movie's most cringe-inducing moment, Ruth confesses to an ignorance of what that word means, so the script can deliver its definition, as if any viewer unfamiliar with apartheid would ever watch a movie like A United Kingdom. The pair marry regardless, and find various forces, both black and white, attempting to tear them apart. Despite the best efforts of Oyelowo and Pike, Seretse and Ruth never feel like actual human beings. The script is so distracted by ticking off a series of political bullet points, it forgets to develop its two central characters. He's black, she's white, and they both enjoy jazz; that's pretty much all we're offered. In the movie's second half, Seretse is exiled to London while Ruth stays in Botswana, reducing the latter to that all too common trope, the crying wife on the other end of the phone. A story of intolerance such as this should stir anger in the viewer, but it's delivered in such a dispassionate manner by Guy Hibbert's soulless script and Asante's TV movie direction, that we're left curiously cold. When Seretse and Ruth are being treated awfully by Brits and Botswanans alike, it's hard to care, because nobody involved feels like anything more than a cardboard cutout, none more so than Tom Felton, who seems to be using his role as a mustachioed and bespectacled government official to audition for a role as a Nazi in the next Indiana Jones movie. 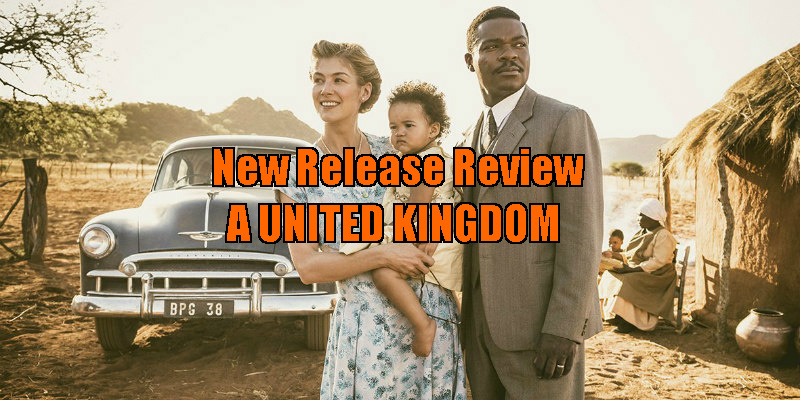 A United Kingdom ends with that classic biopic cliché, a freeze frame of its protagonists, hands aloft after conquering adversity, and the explanatory intertitles that follow tell us a lot more about Seretse and Ruth than the previous two hours managed. A film that plays like a Monday morning lecture, A United Kingdom will find its natural home on TV/DVD combo players wheeled into classrooms by teachers too hungover to deal with their pupils. A United Kingdom is in cinemas November 25th.